Monday, November 6, 2017 - Momentum stocks continued to drive US Equity Markets which set new highs last week with the S&P 500 and NASDAQ Composite closing at 2587.84 and 6764.44 respectively for a weekly gain of .26% and .94% on the release of the first comprehensive Tax Reform Bill in over 30 years by House Republicans and a moderately good employment report. Stocks shrugged off a terror attack in NYC, Tech and Energy stocks roared ahead as investors are beginning to sense a turnaround in Oil & Gas producers. This can be seen by the MSCI US Momentum Index which is up 33.9% thru the end of October compared to the MSCI US Index which returned approximately 17% over the same period. Trump’s announcement of his selection of Jerome Powell for Fed Chairman to succeed Janet Yellen signaled a continuation of Fed Policy to investors. Investors appear to be looking forward to continued strong economic growth partially from rebuilding efforts from hurricane damages in Texas, Florida and Puerto Rico as well as corporate tax reform including the repatriation of foreign earnings. The latter is critical to fund the proposed infrastructure spend pursued by both parties. While the tax debate is just starting, investors should consider that the new tax bill will limit tax subsidies to borrowers across the board thus discouraging highly leveraged deal making. This is very significant but little understood as the tax code has favored borrowers for decades. The High Yield Sector could suffer negative consequences if the proposed bill stands as is. Nevertheless, the reduction in corporate taxes and incentive to repatriate overseas cash is key to expanding the economy particularly in high value infrastructure projects. On the international front, the POTUS started an extended trip in Asia to reaffirm US commitments to the region, discuss trade and the issue of North Korea. The big surprise over the weekend was news out of Saudi Arabia of an anti-corruption clampdown in across the board and a missile attack on Riyadh. While the purge is likely an attempt for the Crown Prince Salman to consolidate power to push through a much needed aggressive social and economic modernization program, more troubling is the missile attack on the capital which signals a new level of instability in the Middle East. Frontier investors in the Middle East should heed news events and be prepared to trade on any unexpected developments. In the ETF space, it was not a good week for Active Managers. 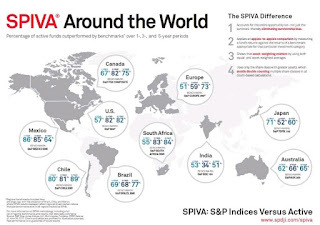 First, S&P DJI released their latest SPIVA report card on Thursday which showed that active managers across the globe have failed to keep up with their respective benchmarks (see chart below). Business Insider went as far to say that “This is one of the most devastating reports we’ve seen for the future of Wall Street stock pickers.” Simply put, the numbers are the numbers. This no doubt will accelerate the move to ETFs and other passive strategies. 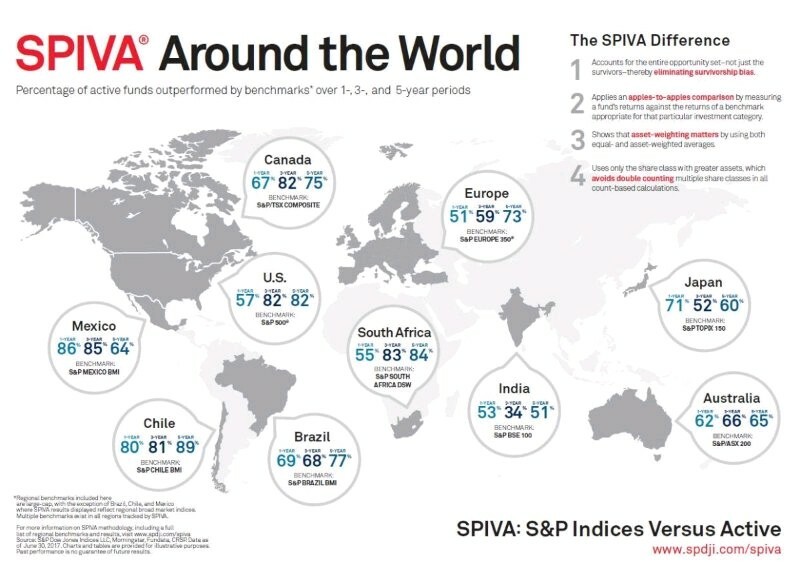 Adding fuel to the campaign against active managers, John Bogle in an interview with the Financial Times last week sees indexing eventually comprising somewhere between 70-90% of the market. This will accelerate fee compression pressures. Astute fund managers are jumping on the trend as evidenced by Franklin Templeton’s announcement to launch a broad complex of low cost country and regional ETFs which will nibble away at the big 3 international funds. These trends show that new research tools like our Weekly Select List and Risk and Reward Ratings are increasingly needed to evaluate the fast growing ETF marketplace. Investing in ETFs requires a new approach to macro investing, one in which investors are just beginning to realize. Interest in these themes are seen by weekly percentage gainers in our Weekly Select List and jumps in Energy ETFs such as QCLN, PCG and MLPY and KSA for Saudi Arabia. Investors and traders are advised to check our Ratings and Select list to gain insight into the latest news developments.